With a little upfront planning and an additional 10% extra in building costs you maybe able to reduce your new home’s future energy bills by up to 50%, by building an energy efficient home. Standard built homes typically employ a few basic energy efficient elements that mainly include Insulation, Low-E glass windows and an efficient heating/AC system. All these elements are well and good, however a lot more can be done to dramatically lower your home’s energy costs. Let’s start with the heating system. Typically duct based heating / air conditioning systems focus on an efficient heat/cooling power plant. What’s frequently neglected, however, in building an efficient heat/cooling system is taping and sealing the duct work. By not taping around all the duct seams, a significant portion of the generated hot and cold air does not make it to its prescribed destination (e.g. the living space). When building an energy efficient home it is important to make sure all of the duct seams are taped. Next, the positioning of the home on the property can make a huge difference. Work with your architect to position the home so that it takes advantage of the terrain and sun exposure. If you live in the north, try to position the side of your home with the most windows, to face southwest. The side of the home with the least windows should face either northeast or northwest. The proper positioning of a home is key in building an energy efficient home. Besides saving on heating and air conditioning bills you can also reduce your electric lighting bills if a house is properly positioned on the property. Consider developing a home floorplan that takes advantage of the sunlight when your home. For example, you may prefer to have a well lighted kitchen in the morning, so design your home to take advantage of the eastern rising morning sun. Employ low overhangs over windows, if you live in the south. The overhangs will help shade the sun from entering into the windows and heating the living space. Also, plant trees in front of windows that face south. Overtime, when the trees have reached 15 to 30 feet in height, they will begin to pay dividends by keeping your house shaded and cool during the summer months. On outside walls of your home also consider installing two layers of drywall with a rigid foam insulation sandwiched between them. This is in addition to installing face insulation in-between the wall studs. The attic is a major heat loss in winter months, as well as a large contributor to heat build up in upper level rooms during summer months. Pay particular attention in insulating the attic. Try to effectively create an air barrier between the attic and the rest of the home. Also employ the use of attic fans or whole house fans to draw the heat out of the attic during the summer months. Besides reducing your air conditioning bills you’ll extend the life of your home’s roof. In the foundation and basement areas when building an energy efficient home, make sure that when your building the home to insulate the outside foundation walls and below the basement floor. Typically rigid foam is attached to the outside foundation walls prior to backfilling around the foundation. Also make sure that a vapor barrier is installed underneath the basement floor to reduce moisture buildup in the basement. These few basic home building tips can save you a bundle in energy bill costs and none of them are overly complicated or expensive to implement. In addition, they will help provide you with an energy efficient home that is more comfortable to live in throughout the years ahead. So talk to your architect and builder before you start your new home construction. 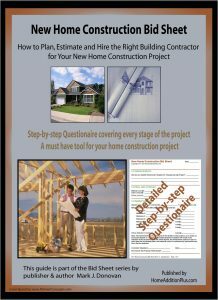 For more help on building an energy efficient home, see HomeAdditionPlus.com’s New Home Construction Bid Sheet. 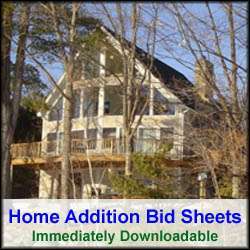 The New Home Construction Bid Sheet provides you with the knowledge on how to plan a custom home building project, and what to look for when hiring contractors for your new home construction. It also includes a detailed cost breakdown table and spreadsheet for estimating your own new home construction building costs.